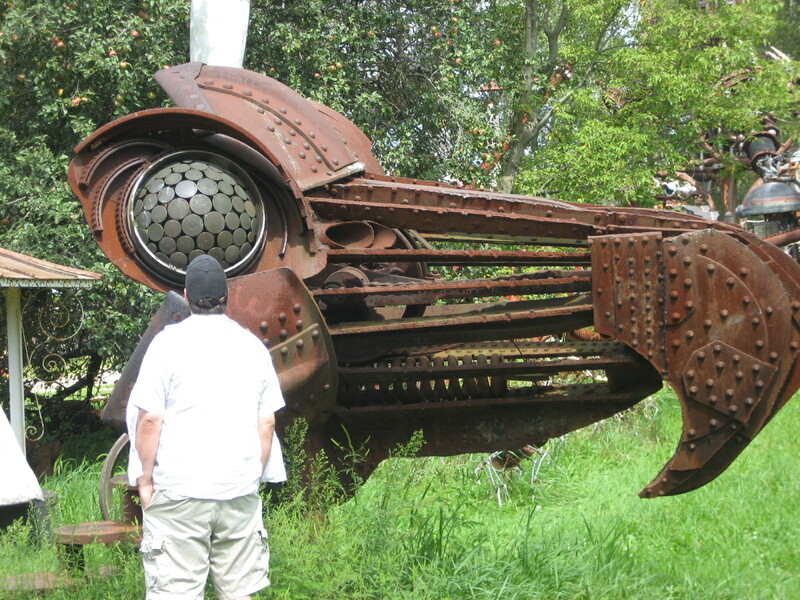 This site has some good photos of Tom’s work, which is located in his own personal park. 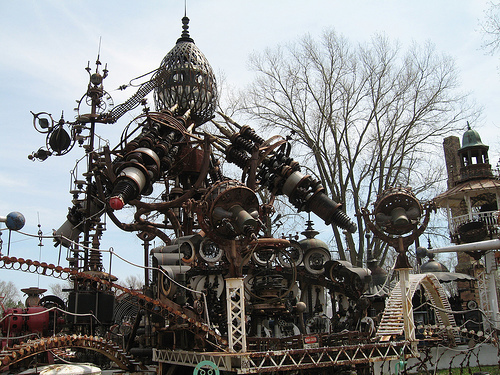 There is also a small story behind his alternate personality, Dr. Evermor, which attempts to explain the large abstract art that he creates. On his website there is much information on his work. Also, if you are interested in touring the park in Wisconsin, you will find it is open 5 days a week. I am personally trying to find a way to get their myself, anyone feel like driving? 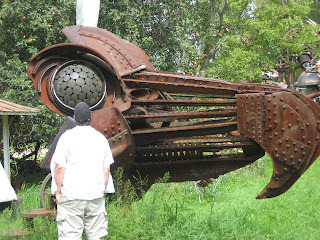 But if you would like the full story and all the photos to gawk at, there is no better sight then the one below, this has the PBS article on Tom Every and is filled with all the crazy background information you would expect from someone who designs gigantic lightning machines. We live in a modern world where traits like creativity are often repressed. I chose Dr. Evermor not only because the medium he has chosen had its mold broken long ago, but he himself broke the mold. Some people seem to mock his crazy antics, but at least he is passionate about something. Which in this day and age seems to be something that is less and less common by the day. To all the other creative people out there, Good Luck! And I hope you find Tom Every’s story as interesting as I did! 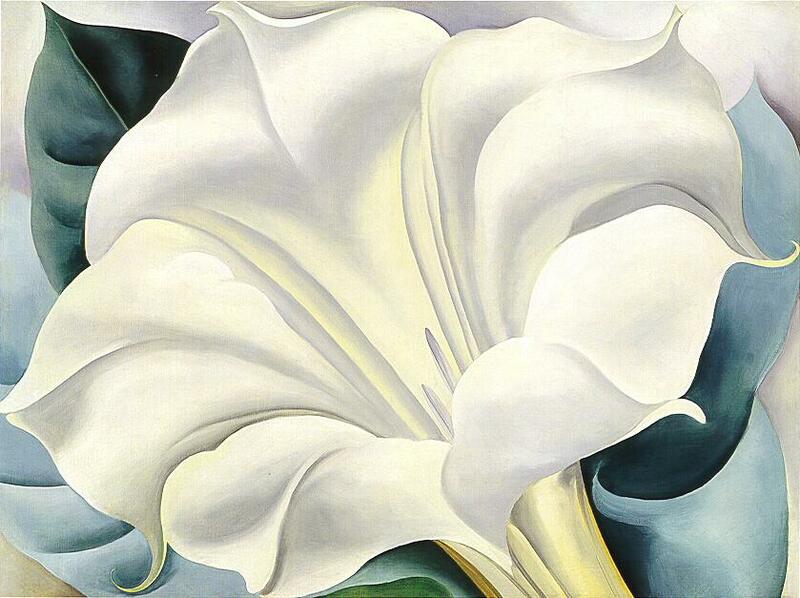 I find Georgia O’Keeffe one particularly inspiring artist. She was a feminist painter. She painted flowers, but was criticized for painting in a way that was provocative and inappropriate because many thought that what was actually being depicted was female genitalia. This was very apparent in some of her pieces, and now so obvious in others. "About the Painter." PBS. PBS, 26 Apr. 2006. Web. 02 Aug. 2012. <http://www.pbs.org/wnet/americanmasters/episodes/georgia-okeeffe/about-the-painter/55/>. PBS had very interesting information about artist, Georgia O'Keeffe. It went over the life that she lived. Information included was her family life, her schooling, as well as her career as an artist. "Chronology -." Chronology -. Georgia O'Keeffe Museum, n.d. Web. 02 Aug. 2012. <http://www.okeeffemuseum.org/chronology.html>. This website provided a timeline of Georgia O'Keeffe's entire life. It highlighted great achievements, such as being recognized by the president. The information came from the Georgia O'Keeffe Museum. Because her work is so detailed and beautiful, I think that it would be incredible to visit this museum, which is located in New Mexico. "Georgia O'Keeffe Biography." Georgia O'Keeffe Biography. N.p., n.d. Web. 02 Aug. 2012. <http://www.lkwdpl.org/wihohio/okee-geo.htm>. One of the most impressive pieces of this website was the inclusion of the artists greatest accomplishments. I felt that this website really highlighted O'Keeffe as a feminist painter. I also found the following quote from Georgia O'Keefe very interesting: "I get out my work and have a show for myself before I have it publicly. I make up my own mind about it–how good or bad or indifferent it is. After that the critics can write what they please. I have already settled it for myself so flattery and criticism go down the same drain and I am quite free." Michael Bay is one of my favorite movie directors/ Producers. Some of the greatest movies of all times were produced by him. All of his movies are fun and energetic giving you that chilling, excited feeling while watching. Titles like Transformers, Pearl Harbor, Armageddon, and The Guardian are all films he produced. As a director he has a great sense of what actors will fit good in certain roles. This is an excellent skill to have and makes for a much more interesting movie. Bay has received five MTV Movie Awards: Best Movie and Best Summer Movie You Haven't Seen Yet for Transformers, Best Action Scene for Pearl Harbor, Best Action Scene for Bad Boys II, and Best Action Scene for The Rock. This Link is to an article talking about one of Michael Bays greatest movies "Pearl Harbor". The article talks about coming up with the story line and how they redid an event so significant. This next link is for my second favorite movie, Armageddon. This link talks about the filming and what went into making such a unique film about the world almost coming to an end. I figured I would save the best for last. Most of you have heard or seen the great film Transformers. Said to be one of the biggest films in ages, here is a video that was played at the oscars. Born in 1921, Seydou Keïta was born under French colonial rule in Bamako, Mali. At the age of 14, though his freedom was stifled, his creativity surged after receiving a Kodak Brownie with 8 exposures of film remaining. 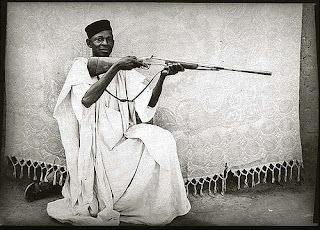 After being taught in Paris by a French photographic supply store owner Pierre Garnier, Keïta returned to Mali in 1948. 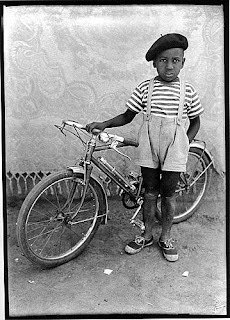 He allowed his talents to take flight through photography with a deep sense of patriotism, in what was arguably the most important period in Malian history. Keïta and his people were hungry for independence and eager to take back their nation with a striking mix of tradition and modernity. His photos were portraits of Malian citizens as they wished to be seen by the rest of the world. In their wake they left behind African stereotypes and enslaving prejudices that were preached and believed by many across the world. Keïta’s artwork exceeds composition or aperture; his photographs provide a visual account of the liberation of Mali. They show the awakening of a country coming together to demand respect and freedom. Through a medium that requires no words at all, Seydou Keïta beautifully documented the protesting screams of his fellow countrymen. This is Seydou Keïta’s official website, which provides a summary of his background and career. It has an extensive archive of his photos, as well as videos, and information regarding recent exhibits. This website is another good representation of Keïta and his artwork, with many of his photography and an interesting selection of his past solo exhibitions. There is also an insightful video of Keïta himself doing what he does best, taking a photo. This website has organized the works of many photography artists, and has another brief summary of Keïta’s past as well as his achievements. The selection of photos are some of the most iconic from Keïta’s collections. 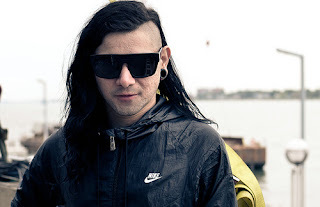 I'd like to start off by saying, Skrillex is not my favorite EDM (Electronic Dance Music) artist. However, the amount of respect I have for Sonny Moore, and the way that he has shaped electronic dance music over the last few years is astonishing. http://skrillex.com// - This is Skrillex's official website. You can view all of his music productions, buy merchandise, and find links to his Facebook and Twitter on here. http://www.facebook.com/skrillex - This is his Facebook. Here you can follow his posts (keep updated on everything he chooses to make known to the public) and view some of his music productions. http://www.youtube.com/user/TheOfficialSkrillex - This is his Youtube channel. On here, you can view any of Skrillex's music he has produced and an assortment of other videos. Keith and Kristyn Getty have been writing hymns for more than a decade, bridging the gap between traditional and contemporary, and creating what is described as singable theology. Their songs, many co-written with Stuart Townend, have pioneered a new generation of modern hymns. The renowned Getty/Townend hymn, “In Christ Alone,” has remained the most popular song for congregations throughout the UK for six years, among CCLI’s top ten in North America, and has been honored by both the British Hymn Society and BBC Songs of Praise all time lists. Their hymns are sung in small churches, large cathedrals and concert halls around the world, performed by choirs of every description, and have also been recorded by artists throughout the world of music, from country artists Alison Krauss and Ricky Skaggs, Irish musicians Moya Brenan and Anuna, CCM artists Natalie Grant, Newsboys and Tim Hughes, to Aida’s Heather Headley, and a recent online recording by Owl City. Ultimately, I chose these artists because I absolutely love hymns. I find both the content and the simple harmonies to be peaceful and inspiring. What Keith and Kristyn have done is add some "flair" to traditional hymns, while still keeping the meaning and the rich, beautiful harmonies intact. They offer variety and changeless favorites at the same time, making them a marvelous duo. Hope you all enjoy! http://www.gettymusic.com/: Here is the link to the official webpage of this hymn writing couple. There are a variety of tracks and lyrics posted here, as well as information about upcoming events and interviews. Lastly, there are also links to their individual blogs so you can learn more about what makes these two tick! www.Gettymusic.com/tour.aspx: This link takes you to an article about one of their upcoming tours in their "stomping grounds": Northern Celtic Tour 2012. Keith and Kristyn are from Ireland and their rich celtic background adds depth and uniqueness to their creative vocal style. In addition, here you'll find information about their leadership events too! My discovery of Ansel Adams' work came at a very young age during a family trip to Yosemite National Park, and over the years I've been able to piece together why his work stood out to me. I've always enjoyed the outdoors, especially locations far from civilization and the calmness associated with them. I find myself able to just sit hour after hour, just watching nature while I'm unable to sit through an hour long television show without fidgeting and becoming restless. 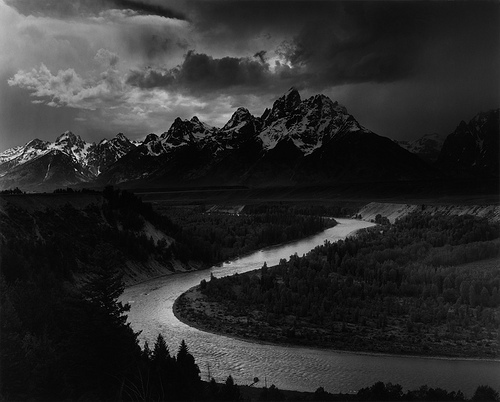 What drew me to Ansel Adams' photographs is that they capture some of those moments in time and make them accessible all over the world. I'm able to glance at his work and be momentarily transported out of my house, or a classroom, or wherever I may be. An overwhelming majority of the rotating backgrounds on my computer follow this theme, and although they were taken by different people, I attribute Ansel Adam's with my discovery of how powerful these images can really be. Family owned and operated site dedicated to distributing Ansel Adams' work. The official site of the Ansel Adams Gallery at Yosemite National Park. PBS's documentary spotlight on the photographer Ansel Adams. Electronic dance music has expanded immensely these past few years, especially durring 2012. House and club music have started to become the wave of the future for music. We see in on tv shows, in commercials, and now incorporated in main stream music. Kaskade has been around longer than new listeners would expect. His interest of club music started when he was a teen in the 80s. Then further progressed his skills and knowledge when he attended University of Utah in 1992. After many small shows at local clubs and traveling the United States, he first started to make a big name for himself durring 2001 with his first single "What I say" after this moment Kaskade exploded in the club music sene. Ever since that moment he has become a world known DJ. Kaskade has been an artist that I have followed since the beginning and it's an amazing experience for me to see him progress so much. I have seen him live and my breath was taken away. His sounds, rhythms, and beats have the ability to make you feel that you are on another world. 1. This first link is a brief biography and how he started his career. Music can be a way for artists to convey a message to listeners regarding love, desire, emotions, strength, or personal struggles. Music can also be relaxing to the mind, which is why some people can turn to music as a way to take a break from busy lives and enjoy soothing sounds and instruments that is calming and repose. For me, Coldplay is a band that I can listen to while doing work, driving around, or even as an artist I can go to if I want something good to listen to. Coldplay is a rock band that is from Great Britain consisting of four members: Guy Berryman (bassist), Jonny Buckland (lead guitarist), Will Champion (drummer), and Chris Martin (lead vocalist). Being formed in 1996, they have been recording and releasing EP's until the year 2000 when they came out with "Yellow," making them famous worldwide. After releasing this single, Parachutes became their debut album being released on the 10th of July in 2000. Following their debut album came the album A Rush of Blood to the Head, X&Y, Viva la Vida or Death and All His Friends, and recently Mylo Xylto, which is one of my favorite albums by them. A couple notable songs that have been ranked high on the Billboard Charts worldwide are "Clocks" from A Rush of Blood to the Head, "Viva la Vida" from Viva la Vida or Death and All His Friends, and "Paradise" and "Princess of China" from Mylo Xylto. Coldplay's musical style can be known as soft rock and can be meditative. Sometimes their music can reflect and describe emotions and desires. Some critics, due to Martin's unique worldplay, can describe sometimes the lyrics in their songs as feminine. Despite this, Coldplay has attended, performed, and received awards worldwide such as at the Brit Awards, World Music Awards, Billboard Music Awards, and Grammy Awards. After being a band for over fifteen years, Coldplay still rises to the top of the music charts through their unique music worldwide. I find Coldplay's music unique since it can be soothing to one's mind. Many of their songs are very peaceful instead of having a heavy dance beat or heavy guitar solo. 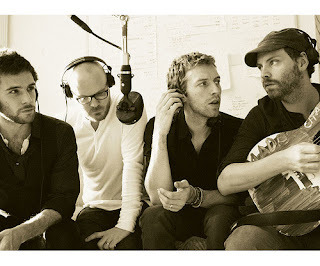 Although their lyrics and messages of some of their songs can be somewhat strange (such as Yellow), it is the music being produced by the guitars, drums, and vocals that make Coldplay's music stand out from many other artists in today's culture. 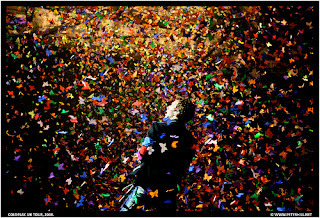 Coldplay's Webpage: This is Coldplay's official website where they post concert dates, blog posts, and music. This allows fans of Coldplay to keep up on the latest news and concerts. Coldplay's merchandise (shirts, mugs, hats, and other apparel), CD's, and singles can all be found on this website. "Yellow," Coldplay's first worldwide single is featured above. When composing this song, they came up with the title "Yellow" referring to the Yellow Pages phonebook. As odd as it seems, Martin in an interview explained that "yellow" does not have a direct meaning. 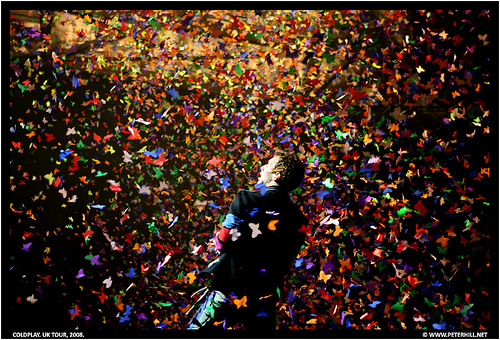 Martin's falsetto solo and the acoustic guitar features are some of the things that made this song popular worldwide, giving Coldplay their rise to popularity. "Paradise" by Coldplay is about not giving up on your dreams. The story featured in this song is about a girl with a disappointing life. When she goes to sleep, she dreams of paradise. This song can be relatable to anyone, forcing one to make use of his or her dreams. If the girl featured int he song dreamt of paradise, she can obtain this "paradise" if she does not give up on this hope. 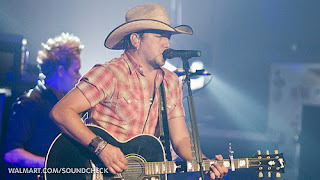 Jason Aldean, his real name being Jason Aldine Williams happens to be my favorite country artist. I have grown up with nothing but country music creating a deep connection within me to my passing childhood. Certain songs evoke memories within me allowing me never to find anything as wonderful and meaningful in the music industry as country music. Jason Aldean’s music career didn’t take off until the year 2005, but the stories within his music are moving and relatable to ones own life. Jason Aldean is a true inspiration and roll model. He acts as though he is a normal guy no too big for his britches with a hunger to sing. All of my friends understand my love and appreciation for Jason Aldean, one of them yelling out “JASON ALDEAN ON TV TURN IT UP!” during this years country music awards. His musical works are modern that reach the tastes of our current generation, yet don’t sway to far away from what the real meaning of country is. His works are worth listening to in any age group. This link is to Jason Aldean’s first single “Hicktown” which hit the top 10 country songs that served as the lead to his emerging album. Housed on this album as well is, his first number one hit “Why”. This marked the beginning of his successful career, also being nominated for song and video of the year at the AMC’s in 2006. Here, Jason Aldean talks about his early career struggles in which he almost gave it all up. Learn how his determination and will to keep fighting turned his country music career around. The following link is Jason Aldean’s Biography from where he grew up, to where he is currently at in his successful career.